(1) All the elements of a great story are present - a hero, a heroine, a villain, a great plot, humor, irony, intrigue, suspense, etc. (2) It's a short book - only 10 chapters. (3) While the name of God is not mentioned at all, His hand is at work throughout this book, just as He is at work in our lives even when we can't see Him. (4) There are lots of feasts and celebrations - who doesn't enjoy a good celebration, right! Setting the Stage - Chapter 1 sets the stage for this dramatic story, so I traced an image from a coloring page. The page was finished with Micron pens, colored pencils, and a clear Wink of Stella pen (to add shimmer to the curtains). The first feasts, hosted by King Xerxes, are found in this chapter. 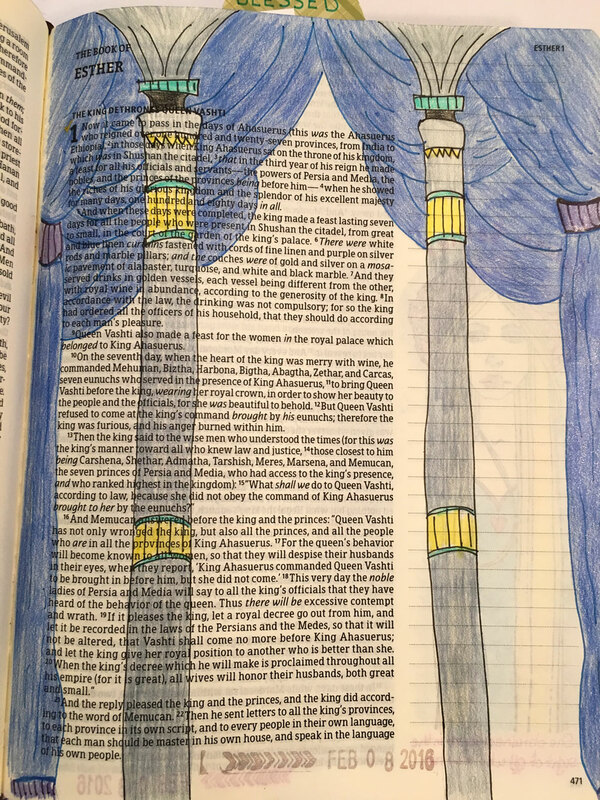 One of the very talented ladies (Jan) who has attended several of my classes actually draws all the illustrations in her Bible. She gets lots of INSPIRATION from Pinterest, then draws and colors in her own illustrations, which she's graciously allowed me to share here. Tough Being a Woman - My friend Minetta used the subtitle to Beth Moore's Esther Bible Study as a heading for this book. Queen Esther - We first meet Esther in Chapter 2 - an orphan who has been raised by her cousin Mordecai. She is taken to the king's palace during a nationwide "beauty pageant" designed to help the king find a new queen. Amazingly, in the midst of everything, she found favor with all who saw her. 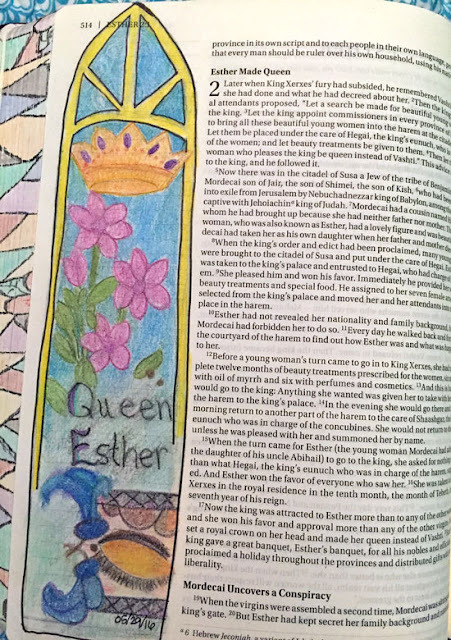 I used the Creating in Faith Esther stamp in the margin of my Bible and filled it in with colored pencils before adding a short caption with a Micron pen. 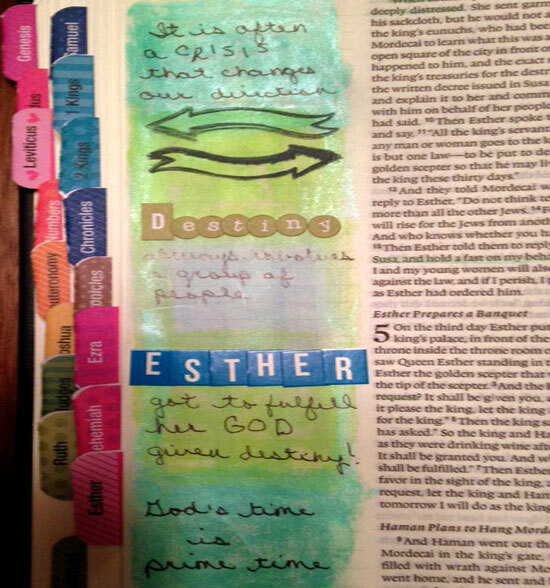 One of my workshop participants, Jerri, cut a photo from a magazine to use as INSPIRATION for Esther and it turned out fabulous. I also really like the way she used a border stamp as the header. Another class participant used that same stamp to create the valance for curtains on a page similar to mine setting the stage. I've had this stamp in my collection, but it has gone unused until now! 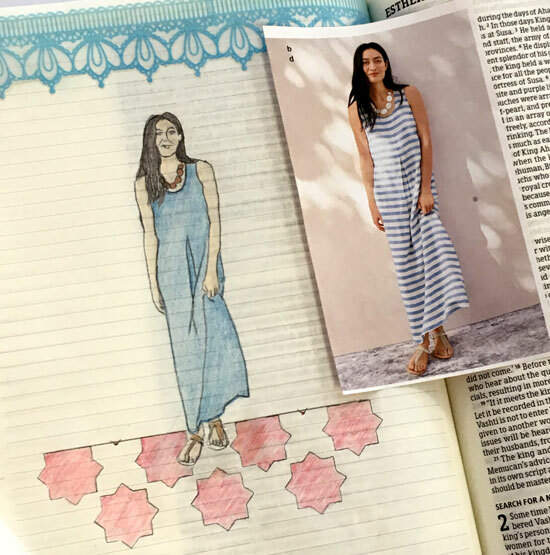 I can't wait to try it on a page soon, too! 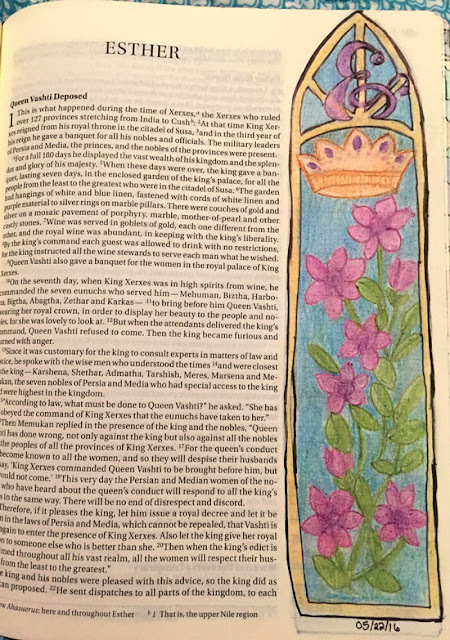 Jan drew another stained glass look for the page in her Bible introducing Queen Esther. 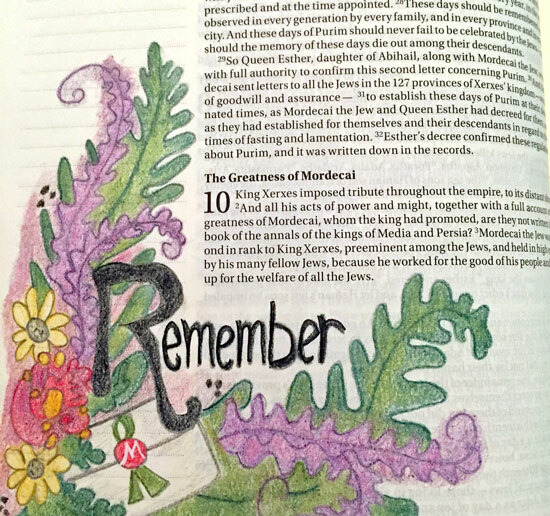 Haman's Plot - Esther's story takes a huge turn when Haman, the king's right-hand man, creates a decree that will annihilate the Jews - all because Modecai will not bow down to him! I added a few layers of torn washi tape to this page, but used most of the space for journaling the story in chapter 3. Such a Time as This - Mordecai sends word to Esther in the palace that she must petition the king for the lives of the Jews. There ensues a back-and-forth dialogue which ends with Esther agreeing to go in to the king despite the fact that she could be killed for entering his presence without being summoned. During that conversation, Mordecai reminds her that she may have come to the position of queen for "such a time as this." 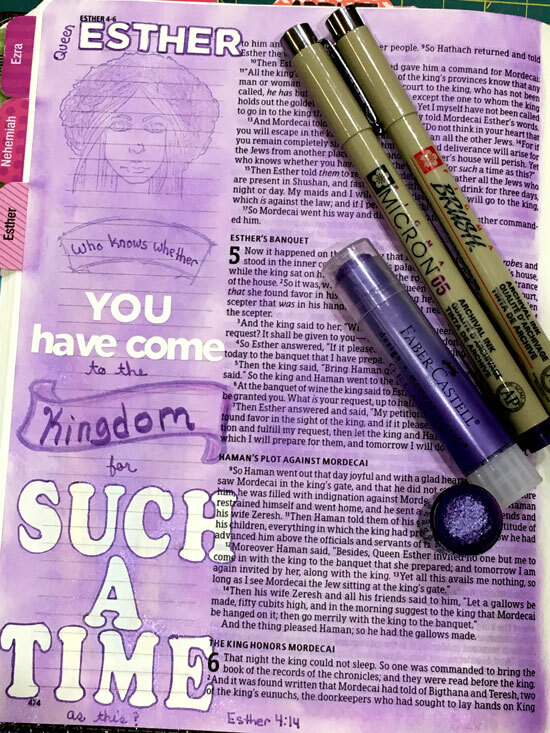 I used a purple gelato to create the background for my page, then added stamping, white letters stickers, and handwriting to complete the scripture. Sorrow into Joy - Of course, God was in control and the Jews were saved, which called for a celebration. 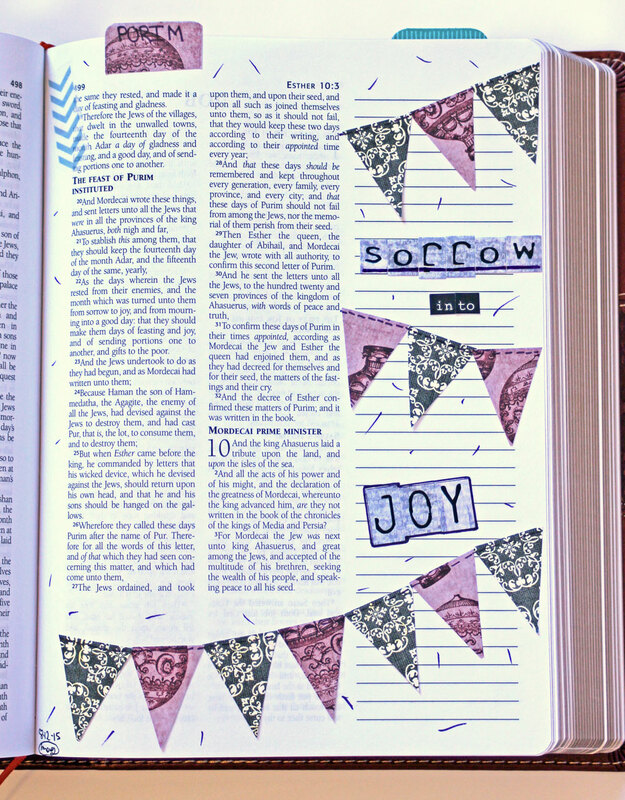 Some of you might recognize this page from the Scrappin' Goodtime display Bible as one of my not-so-stellar Bible journaling pages, however, as I took time to cut the banner pieces from patterned paper scraps and choose letter stickers for the wording, I was also thinking about God's provision and how often He has turned my own sorrow into joy. For this page in my journaling Bible, I added a polka dot napkin because polka dots go with celebrations, right. Then I simply used letter sticker for the journaling. The primary reason for the celebration of Purim is to remember how God saved the Jews from annihilation, so Jan's illustration at the end of the book is perfect! Lessons - There are so many lessons in this short book! 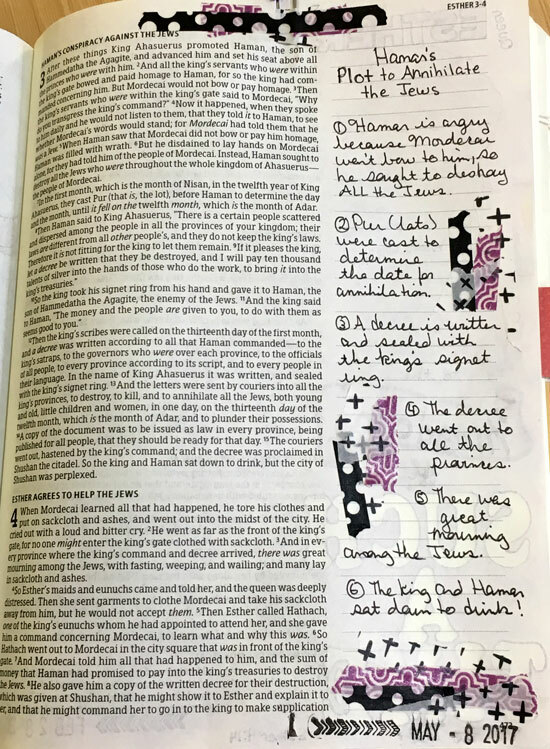 Minetta listed some of them in the margin of her Bible using a combination of handwriting, stamping and letter stickers. I've obviously simplified and shortened Esther's story here in this blog post, and I hope you're inspired to take a fresh look at this dramatic book! 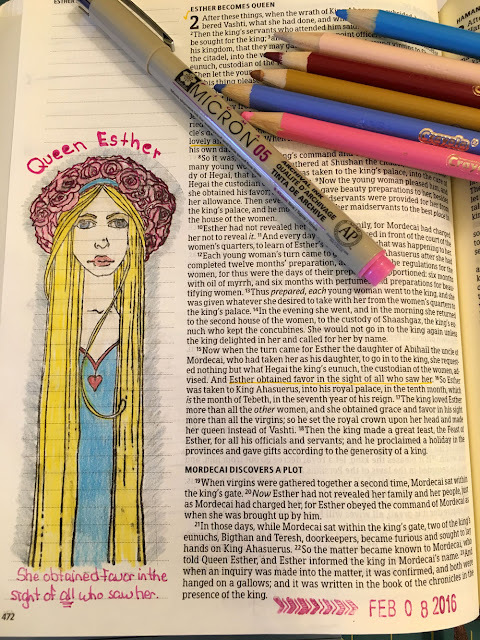 Have you read and/or illustrated the book of Esther? 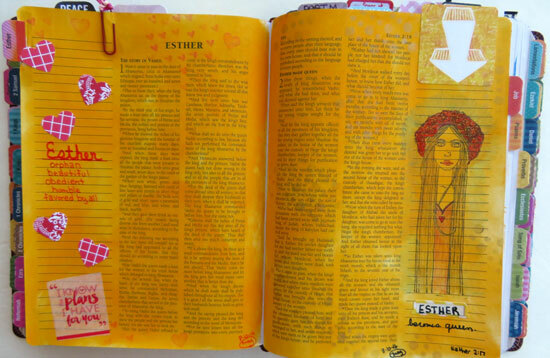 Which part of Esther's story resonates most with you? The ABCs of Reading That Work! I consider myself an avid and ACTIVE reader. I read anywhere from 60 to 120 books a year, plus magazines, blogs, email newsletters, etc. 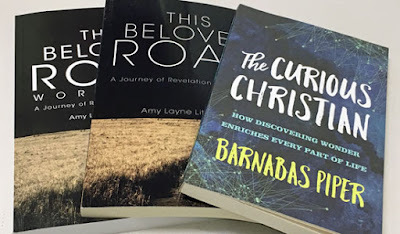 I'm often asked how I read so many books, so when my sister Brenda sent me this blog topic . . . I decided to put "reading" in the blank and share some thoughts and tips to encourage everyone to read more books! Always have a book handy. I have books on the nightstand, books by the stationary bike, books on the end table, and ebooks on my phone. Be brave and read from lots of different genres. Challenge yourself. I'm currently about halfway through my goal to read all the Fiction Pulitzer Prize Winners. Don't limit yourself to one book at a time. I recommend having several books going at once with the caveat that they are all different genres. Reading two fiction books with strong female protagonists at the same time can become confusing! Exercising your brain through reading improves memory. Fiction books are a great way to escape, to learn about various cultures, and to "visit" different places and time periods. In fact, I recently "visited" New England in 1914. Girl Waits With Gun is the first in a series by Amy Stewart and is based on the true story of Constance Kopp, one of the first female deputy sheriffs in the early 1900s. Constance and her two sisters live on a farm outside of town. When their buggy is run down by a powerful silk factory owner, they are thrown into a dangerous situation as he and he gang begin to threaten them. With the local sheriff's help, Constance defends her family and finds that she enjoys helping fight crime. This was a really good quick read. Go to book sales at schools and libraries for an inexpensive way to grow your book collection. Hardback book are wonderful, but be careful when reading large heavy books in bed if you are prone to falling asleep while reading! Informational books don't have to be read all at once. I'm slowly reading Home Comforts, one chapter at a time. This is a huge tome about the art and science of keeping house that I pick up occasionally and read a chapter or two. Just a little time reading each day will help you reach the end of book. Kindles are great for taking lots of books along on vacation! Library book clubs are great places to discuss books with other readers. I enjoyed the discussion about Empty Mansions by Bill Dedman and Paul Clark Newell, Jr. at the Noontime Pageturners book club meeting earlier this month. This book is the true story of the mysterious life of Huguette Clark, the daughter of a wealthy copper industrialist, who was a recluse and spent the last twenty years of her life living in a hospital room despite the fact that there was nothing medically wrong with her. I found this story very interesting because it began with her father who was born in 1839 and made a fortune in copper mining in the late 1800s. After being widowed, he remarried a much younger woman and had two daughters. Huguette was born in 1906 and lived until 2011, so along with the story of the Clark family, this book covers a huge span of history. Interestingly Huguette was alive (and had tickets on the return voyage out of New York) when the Titanic sank and (living just a few miles away) when the World Trade Center towers fell in the terrorist attack on September 11, 2001. Magazines are the best reading material for bubble baths. They are relatively inexpensive and the pages don't take as long to dry if it's accidentally dropped in the bath water. Non-fiction books are written about practically every subject under the sun. Look for books based on your interests, hobbies, travel plans, beliefs, etc. Online reading is popular, but tangible books are a great excuse to get away from the screen for a while. Paperbacks are the great for reading on the beach or at the park or out on the boat or . . . well, anywhere really! Quotes can be pulled from books to help us remember the lessons or information we read. Recently I read Lysa TerKeurst's book The Best Yes, which is about making wise decisions and knowing when to say yes and when to say no to requests. When a new request or opportunity is presented, she encourages us to ask, "Could this fit in my life physically, financially, spiritually and emotionally?" *We must not confuse the command to love with the disease to please. *In God's plan, you've got a part to play. If you know it and believe it, you'll live it. *The decisions you make determine the schedule you keep. The schedule you keep determines the life you live. And how you live your life determines how you spend your soul. Re-read your favorite books! There will always be too many books and too little time to read them all, but perusing a favorite story is like visiting old friends. I enjoy reliving Corrie ten Boom's story in The Hiding Place and scheming with Scarlett to save Tara in Gone With the Wind again every few years. Share books and recommendations with friends and family. Tweens often have great book recommendations. In fact, I recently finished the books my 12-year-old twin nieces sent me as part of the monthly book swap my sister Brenda and I are enjoying this year. The Whizz Pop Chocolate Shop was a very cute & FUN book to read. 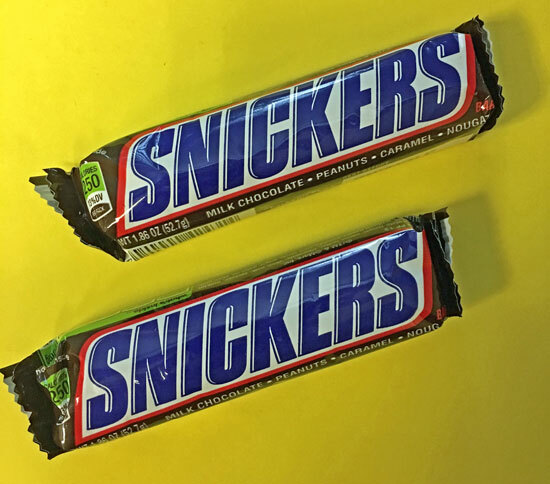 The story involves twins who discover they have magical powers, a talking cat, a chocolate potion for immortality, and a secret organization that's tracking down the twins' evil uncle. Here's an interesting tidbit - the cat's name in this book is Demerara. I'd never seen this name before, so it took me a while to decide how it should be pronounced (even if it was only in my head while I was reading). I just assumed it was a made-up name for the story. However, a week or so later, I was reading Answers to Prayer (which I reviewed HERE) and I saw that word again. It turns out Demerara is a historical region in the Guianas on the north coast of South America which is now part of the country of Guyana. Crater Trueblood and the Lunar Rescue Company is the third book in a triology. This story is set on and around the moon and involves a helium-3 miner (Crater Trueblood), the granddaughter of a wealthy and powerful family on the moon, a kidnapping, and a plot to destroy the earth. Another FUN read! And here's another interesting tidbit - I recognized the author's name because I read his memoir, Rocket Boys, several years ago. After building rockets as a young boy and working as a NASA engineer, Mr. Hickam is now an author of science fiction books! Unraveling a good mystery can cause time to pass quickly! Voldemort should not return! Sometimes authors and readers and publishers just can't let a good thing end and move on to a new story. This was certainly the case for the Harry Potter series as the seven books (and eight movies) covered all seven of Harry's Hogwarts years and had a wonderful ending. Voldemort was defeated and the series ended . . . until J.K. Rowling wrote another story. Websites that share book reviews are worth visiting. I especially enjoy the What Should I Read Next podcast from Modern Mrs. Darcy. Xeric environments are best for books. Young adult books are great, don't disregard them simply because you're no longer a teenager. Robbie and I both recently completed the first three books in the new young adult series, Lois Lane, by Gwenda Bond. As you might have guessed, the main character in this series is Lois Lane of Superman fame. These stories are set in present day. The first book starts out when a teenage Lois and her family move to Metropolis and she enters a new high school (again). She is determined to keep her curiosity under control and stay out of trouble, but (of course) finds herself in the midst of a mystery involving several other students and a company experimenting with questionable uses for virtual reality game technology. 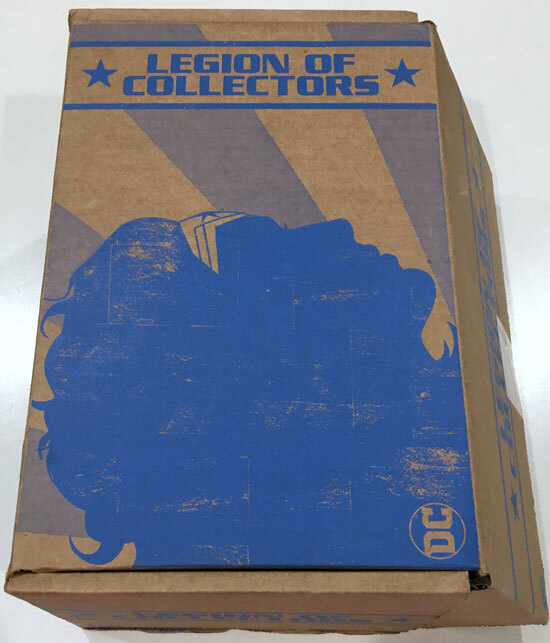 By the end of the story, Lois has uncovered the truth behind the company's research, made new friends, and become part of a group of junior reporters working for the Daily Planet. Oh, and she has an online friend who calls himself Smallville Guy! The next two books continue to follow Lois as she and her friends track down stories, navigate the nuances of teenage friendships, and occasionally find themselves in dangerous situations. She continues to interact online with Smallville Guy and they eventually meet in person in the third book. Very enjoyable reads! Zzzzzs can be optional when you're at a critical point in a book. Sometimes you just have to keep reading to see what happens! I've shared the story and illustrated Bible journaling page about my mentor Ms Faye in previous blog posts. 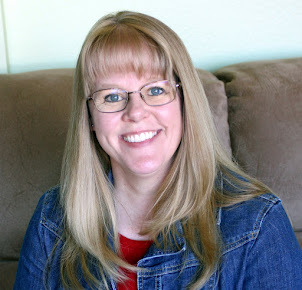 Today, I'm honored to have a guest post about mentoring on the Sweet to the Soul Ministries blog. 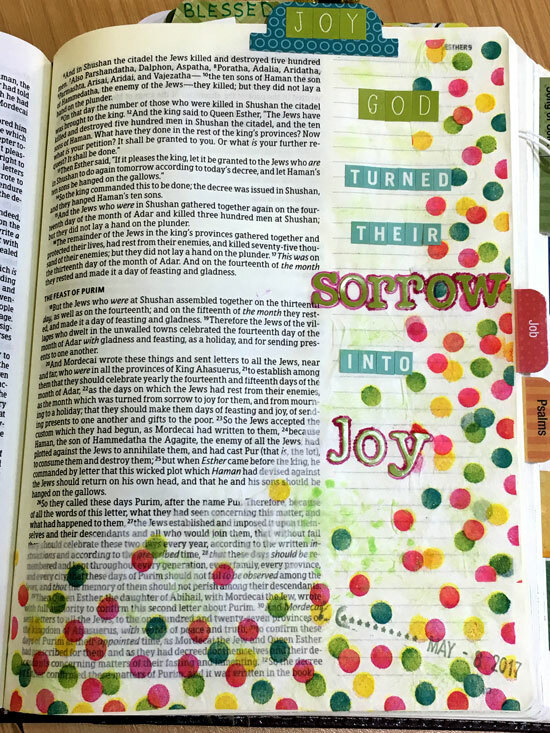 My new friend and the founder of Sweet to the Soul ministries, Jana Kennedy-Spicer, created a beautiful free Bible journaling printable to go along with the post. I downloaded the freebie and printed it on sticker paper to create a page in my interleaved Bible. 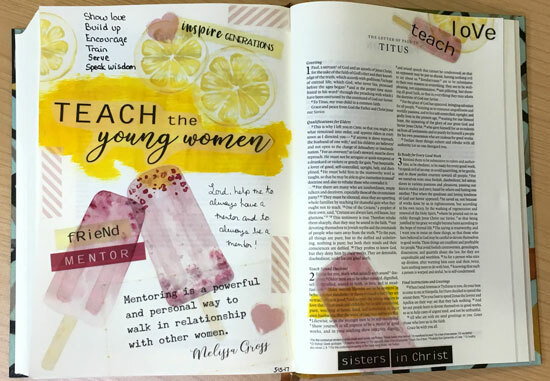 I began these pages by adding yellow acrylic paint as a base for the title and to highlight the scriptures about mentoring in Titus chapter 2. All the other elements are from the free printable. I added in my journaling with a black Micron pen. 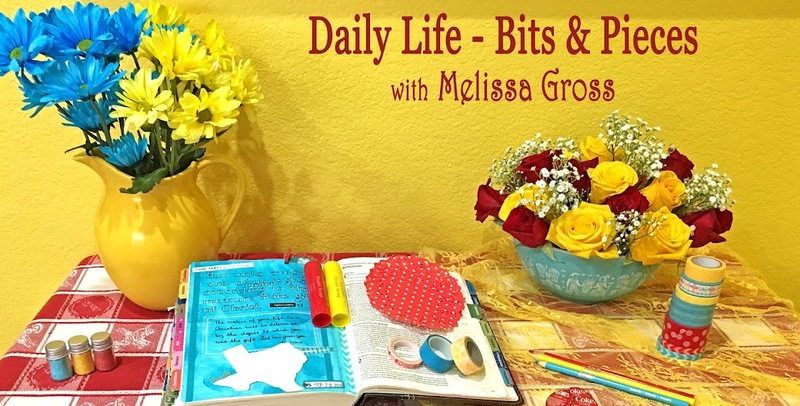 I'd love for you to pop over and check out my guest post and download the freebie for your own journaling and crafting! For the first time in 2 1/2 months, the front room table is completely clean! 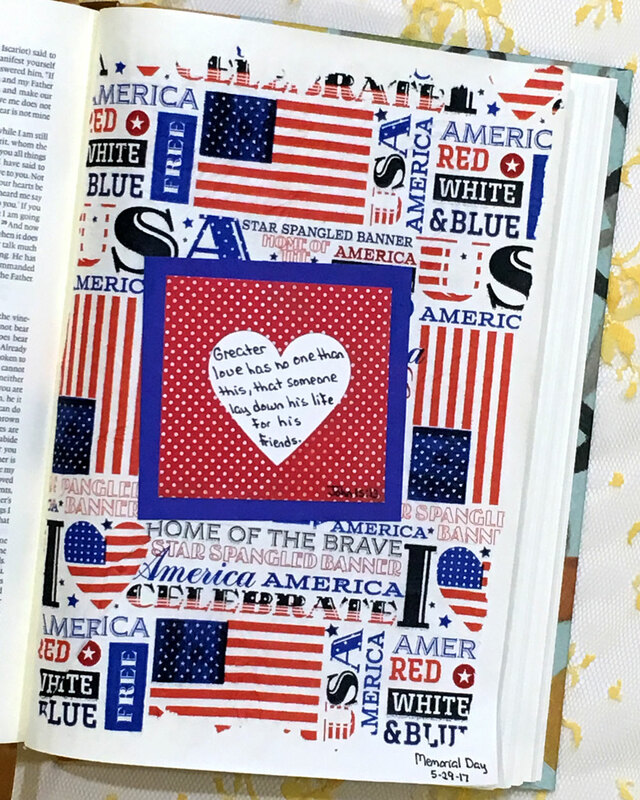 If you saw my post yesterday, you already know that last week I completed the two-volume scrapbook-for-hire project I've been working on as time allowed over the past couple of months. It felt so good to create title blocks for the front of these albums and deliver them to my client. The two albums hold a total of 146 layouts. Two-thirds of the pages are 12x12 layouts with cardstock and patterned paper backgrounds with a combination of photos and memorabilia. The other third of the pages are various 12x12 divided page protectors that mostly hold photos. 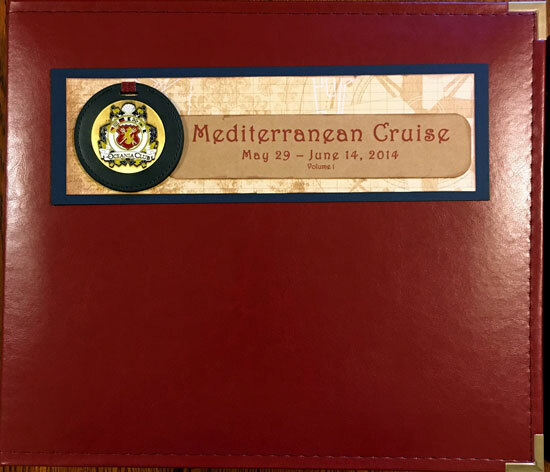 This was a FUN project - creating the layouts, sorting and editing photos, and "visiting" the many sites and countries that my client toured during the 14-day trip. Now, I really want to cruise the Mediterranean! Joining in with Julia at Stamping Ground for What's On Your Workdesk Wednesday. 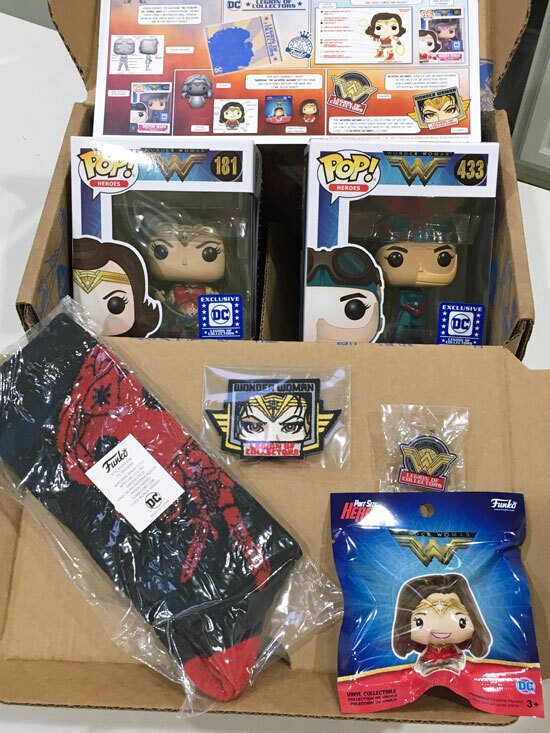 What's on your workdesk this week? Wow, Monday slipped by quickly this week . . . and most of Tuesday, too. Last week was a very productive week, but, first, the mail. Robbie received a FUN box one day. 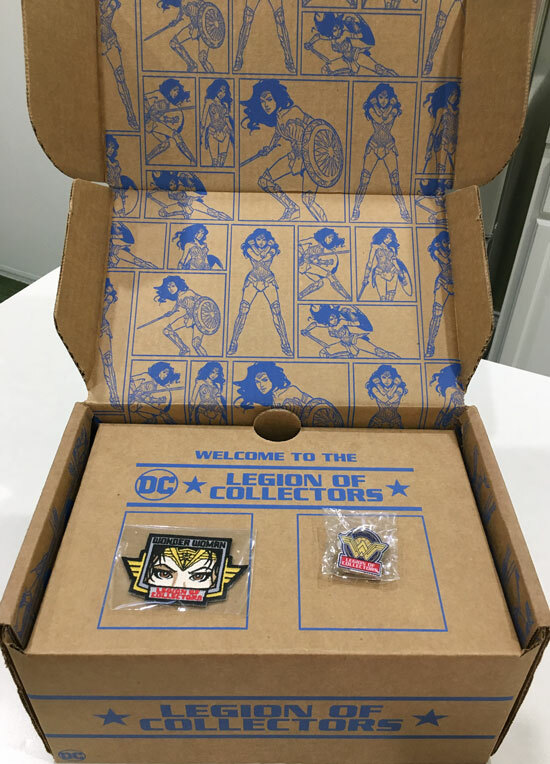 The Legion of Collectors is similar to a scrapbooking kit club, except this one is for comic/toy/trading card collectors. 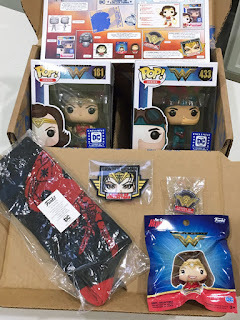 The theme this month was Wonder Woman, so the box was filled with an array of Wonder Woman collectibles. Once again, my happy mail consisted of new books! I also had a special delivery from Robbie mid-week . . .
. . . because it's good to have a little chocolate on hand when I'm finishing up a big project, like this two-volume scrapbook-for-hire job that I delivered to a happy client on Friday! 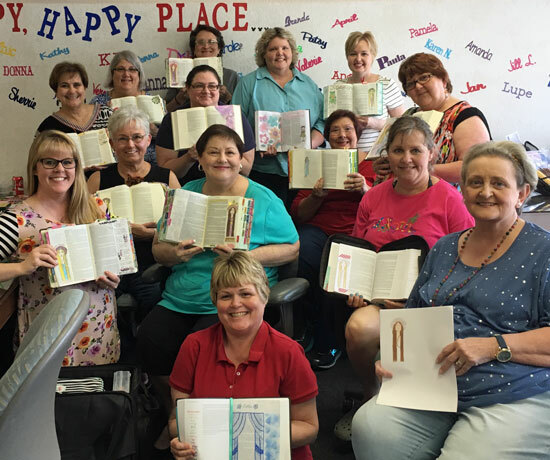 I spent Saturday sharing lessons from the Book of Esther and teaching new illustrated Bible journaling techniques to this group of beautiful ladies. 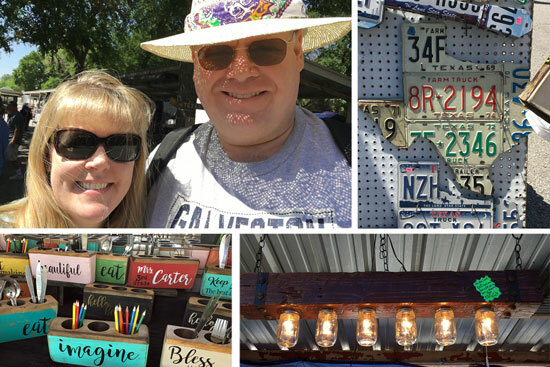 Robbie and I also found time to visit our local outdoor flea market over the weekend. 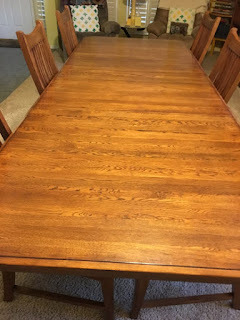 I snapped a few photos of projects we'd like to try. Waving hello (a little late this week) to all the Mondayers joining in with Sian this year as we share memos and mail on Monday!